So do y’all remember me painting on jars here? Well…I took that one step further…. 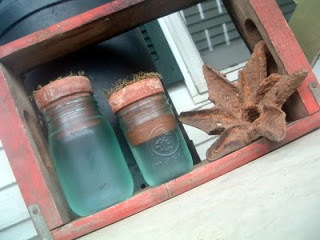 I put my jars in an old Coke crate that the bottom had rotted out of — still looks great as a funky frame! 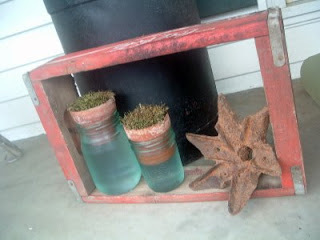 Add in that rusty star hubby dug out of the ground and I am in love! I hot glued those jars down to the crate (kids and dogs again). Now for a coincidence….see those clay pots…they fit into a wide mouth jar pretty much perfectly. Add in some dirt and moss off of an old tree…. I put water in those jars so the moss could continually get water. What do ya think? Pretty good for some old junk! 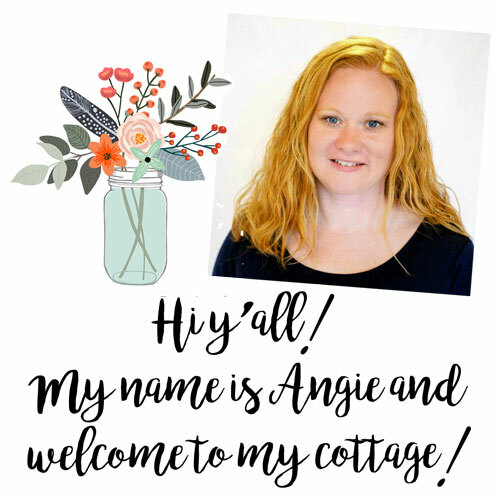 I have many more outdoor projects in the works so stay tuned! You make old junk look goooood! 😉 Cute idea! What a clever idea! I love the pots on top of the jars too! If I can’t find anymore blue ball jars, I’ll just make my own now. Thanks Angie. They look great with the pots on top. Angie, great idea! That saves the nicer ball jars for inside. What a great way to repurpose plain old jars. Thanks for the idea! Cute idea and so clever to make ‘fake’ blue jars! They look so cute and I also love that rusty star! How smart are you??? I really like the whole set up. Wow! Great idea! I might have to try this. I love blue ball jars but I have trouble finding them. I found one a few weeks ago at Goodwill. Some lady saw me eyeing it and practically did a nose dive in front of me to grab it! Thank you for dropping by Tales from Bloggeritaville! LOve your blog too. And what clever ideas for blue ball jars. LOVe it….and that star….gorgeous! Hope you will come back and visit soon. Love the color on your jars and your crafty way of getting it. Too clever! NOW AREN’T YOU FANCY!!! I AM SO GLAD I FOUND YOUR BLOG. I GIVE OLIVIA CREDIT FOR THAT AS YOU ARE LISTED ON HER BLOG ROLL AND WHEN I SAW THE TITLE OF YOUR POST, I JUST HAD TO CHECK THAT OUT. AWESOME. I AM GOING TO DO THIS AND I AM GOING TO READ YOUR POST ABOUT THE PINK ONE WITH THE TAG. I SURE WISH I WAS YOUR NEIGHBOR FOR ABOUT A WEEK…..YOU ARE SO CREATIVE. MY BLUEBALL JARS CONTAIN OLD MARBLES,RIBBONS, SPOOLS OF THREAD….JUST THINGS LIKE THAT. I love these! So clever, with the pots and all and that fabulous crate frame!! Amazing! I just love these clever ideas you come up with! What a fun technique for creating Blue Ball jars….thanks for sharing! these look great! what a fun technique. How cool is this idea! 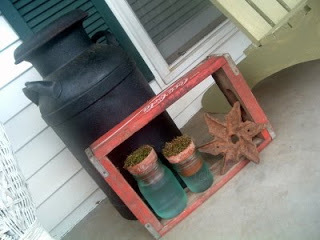 Love how the moss is getting self watered, but also loving how you created fake antique jars… that’s pretty brilliant! And thanks for linking up to the clay pot party! Aren’t you clever? Great idea. I love the blue jars but now you can have both clear and blue! I’m gonna try that! Cute idea!! that is a great idea! i have a bit of a mason jar obsession. Too darn cute – and clever too. LOVE the blue jars! That’s brilliant! I really like this idea! It almost looks like the water is just tinted. I love that color blue. I am going to have to try to remember this so I can try it someday. My mom would like these (she loves blue glass). What a cute vignette. I love everything that you put together. It looks great together. that blue color is amazing! I would love to know the ratio of food coloring to glue, did you use a regular school size bottle? I’m planning to use this idea for my wedding in Sept. and need to plan for 24 or more of these jars as part of a centerpiece. I think this is an amazing idea and SO creative!! Thanks so much!! I was wondering what size pot and what size jar are the ones you used.